The HHG191 Gauss Meter represents the latest design in magnetic measuring equipment, allowing measurements up to 2000 mG to 200 micro-tesla with a basic accuracy of 2.5% plus 6-digit. 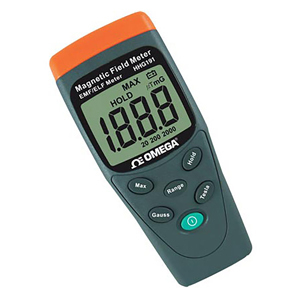 The HHG191 magnetic field meter offers a portable and reliable instrument to measure intensity of electromagnetic fields produced from electric transmission equipment, power line, microwave oven, air conditioner, refrigerator, computer monitor, and video/audio device. The HHG191 meter is a great value instrument for measuring electromagnetic fields in a frequency range of 30 to 300 Hz. 참고: Comes with soft case and one 9V alkaline battery and operator’s manual.